Order the uncensored US Blu-ray. Denzel Washington and director Antoine Fuqua each have an impressive filmography and yet both have one thing in common: they have never participated in a sequel to a film. 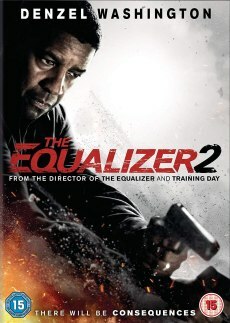 This "anniversary" only came true with The Equalizer 2, the sequel produced four years after the well-received The Equalizer. Washington seemed to be drawn to another embodiment of the character Robert McCall and although he is now over 60 years old, the performance is convincing. In contrast to his colleague Liam Neeson, who struggled hard in Taken 3 to be halfway credible in all the daring action and had to rely on considerable help from the editing room in order to appear agile and fast. But Washington also benefits from the fact that McCall's character, like a teacher or a good Samaritan, wants to convey good values to his fellow men for large chunks of the movie. Those who violate this moral code and react with violence get to know McCall's other side with a CIA past. The Sequelizer, as the film crew jokingly called the film, doesn't have the punch of the first one anymore, the action seems a bit tired and that's mainly because of the opponents, who aren't a comparison to the charismatic characters of the Russian mafia. At the box office, the result was almost the same as from the first part and Fuqua showed himself open for Equalizer 3. Maybe he could then compensate for the weaker impression of the second round. When it comes to acts of violence, they're often just as drastic as in the first film. In many countries, this wasn't a big problem for ratings boards. England, however, was hit harder and this is only due to financial interests of Sony Pictures. The BBFC gave the 18 rating, but Sony wanted to show a version with BBFC 15 rating in cinemas in order to reach a larger audience. Those English viewers who then avoided going to the cinema angrily will also be put off by the home cinema release, because Sony apparently wants to promote the 4K-UHD Blu-ray in England and offers buyers the uncensored BBFC 18 version only on this medium, while buyers of the DVD and Blu-ray will only get the 15-rated cinema version. Fortunately, neighboring countries are more than happy to help via import. The censored BBFC 15 Blu-ray was compared to the uncut German FSK 16 Blu-ray (both from Sony Pictures Home Entertainment). 0:21:00: McCall breaks the second guy's wrist with a loud crack. 1:39:52: How McCall pulls the knives up in the body is missing as is the beginning of the view from the side. 1:43:54: The camera movement along the fatally injured Resnik was greatly shortened in the BBFC 15 version, so that one does not see his burst belly from which the intestines hang out. 1:48:44: It is missing how McCall rams the knife into Dave's neck and cuts it open. Blood and bone pieces fall to the ground.